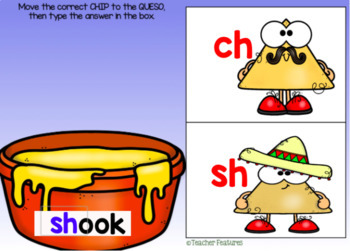 BOOM CARDS PHONICS | DIGRAPHS | First Grade Phonics | Chips & Queso | Cinco de Mayo | Assess digraph knowledge with Chips & Queso Boom Cards. Interactive Boom Cards digital task cards full of movable chips for students to manipulate, then type the correct answer. 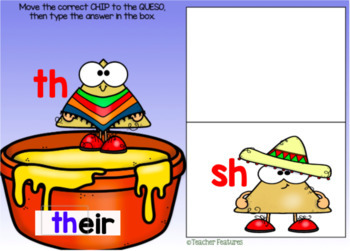 Perfect as a literacy or word work center, review or enrichment. This Boom Card deck contains 35 Boom Cards. Ideal for individual work or literacy centers. Digital Boom Cards offer an easy way for teachers to assess mastery of phonics skills. 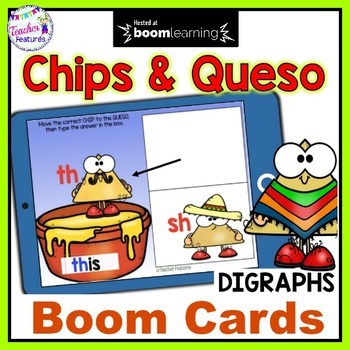 You can use these Boom Cards with your interactive whiteboard, tablets or laptops!